Okorocha, who is also the chairman of All Progressives Congress, APC, Governors’ Forum, said that the reported violent protests in some states’ capitals, including those of Rivers, Anambra and Delta, in the name of Biafra, do not in any way have the support or blessing of the governors and leaders of the South-East geo-political zone either directly or indirectly. Meantime, the Biafra protests continued, yesterday, in Aba, Enugu and Port-Harcourt. Continuing, Okorocha said that the governors and leaders of the South-East condemn the protests, especially when they were carried out in the name of Biafra. “If a section of the people in the South-East or even the whole people in the geo-political zone protest over the bad shape of the federal roads in the area or protest over the total neglect of the geo-political zone, every governor and leader in the area would support that but not to protest over an issue that is neither here nor there”, Okorocha said. According to him, the South-East remains an integral part of Nigeria and the governors and leaders from the area so much believe in the unity of the country and would always work towards sustaining the unity. “As far as the governors and leaders of the South-East are concerned, those behind the campaign for Biafra have their ulterior motive, which has nothing to do with corporate interest of Ndi-Igbo in Nigeria of our collective dream”, Okorocha reasoned. While saying that the concern of the governors and other South-East leaders “is to get what is due for us in our country”, he added that any other quest, especially for Biafra was diversionary. He called on those behind all the protests on the basis of Biafra to give peace a chance and regretted that some Igbo people could get involved in a protest that its end – result won’t benefit Ndi-Igbo in any way, but could lead to the shooting of some of them. “The unity of Nigeria is not negotiable, and the South-East people strongly believe in that unity and would work assiduously to ensure its sustenance”, Okorocha said. 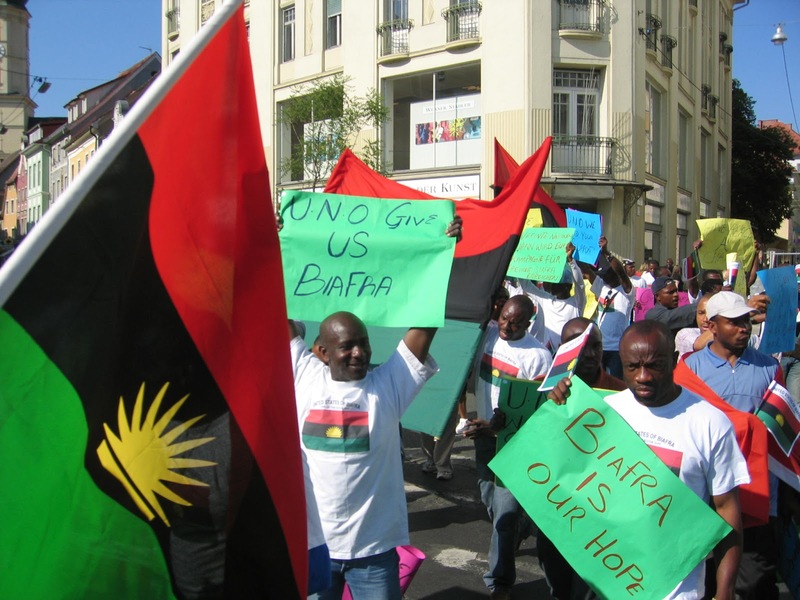 Echoing similar views, Ohanaeze said those sponsoring the latest agitation for the creation of the state of Biafra are corrupt Igbo politicians who are trying to hide under the agitation to avoid prosecution for their alleged crimes. This is even as a new coalition under the aegis of Neighbourhood Watch, over the weekend in Abuja, warned against the activities of the agitators whom they also accused of hiding under the demand for the new nation to enrich themselves. Assistant National Publicity Secretary of Ohaneze Ndi-Igbo Worldwide, Mr Okpalaukwu Okpalaezeukwu,who noted that Ohanaeze and Igbo delegates at the 2014 National Conference articulated the challenges of the Igbo nation at the conference, traced the problem of the Igbo to some selfish and corrupt leaders from the zone who failed to use their former exalted offices to improve the lots of their people and have resorted to instigating the people to violence in the name of Biafra agitation. In the same vein, Neighbourhood watch also accused both MASSOB and Indegenous People of Biafra,IPOB, of using violence, bloodshed and blackmail as a means of advancing the Igbo cause, adding that the only civilized way of addressing such issues is through dialogue. While pledging its unwavering belief in one indivisible Nigeria, National Coordinator of the coalition, Comrade Charles Inko-Taniah, said the Neighbourhood Watch is against secession of any part of the country even as he regretted what he described as “unpatriotic activities of the so called IPOB against the Nigerian state,” warning that it will no longer keep quiet and watch a few he classified as disgruntled and unguided to return the country to any form of crisis. “We condemn in unequivocal terms the increasing trends of violent protests and lawlessness in various towns and cities in the country disturbing and crating panic amongst the people and especially the proposed one million Biafra march against the Nigerian State. We condemn the so called Biafra Radio designed to blackmail, disunite and run down the Nigerian state,” Inko-Taniah added.